The flying season is well underway and we’re enjoying making memories for all of our passengers. We often get asked lots of questions from passengers, so if you are flying with us soon, here is some of the most common ballooning questions we get asked! What does flying in a balloon feel like and is it safe? Ballooning is completely safe. We are certified by the Civil Aviation Authority and all our pilots hold full commercial Pilot licenses so you are in very good hands! Ballooning is an experience like no other. As balloons move with the wind, there is no experience sensation of movement. It’s a relaxed and calm experience and one that we are sure you will love! How long does a balloon experience take? Ballooning is an experience not to be rushed. The actual flight duration is approximately one hour but you should always leave around 4 hours for the whole experience. Passengers are invited to get involved in the setting up of the balloon and the dismantling after the flight but it’s totally up to you if you want to take part or not! Why does balloon flights happen in the mornings and evenings? Balloon flights usually take place within two hours of dawn and around two hours before dusk. The reason for this is because at these times of the day, the thermals are most stable and the winds are usually at their lightest. When is the best time of year to fly? The main flying season is between late March – late October each year. This is when conditions usually improve and when the fields aren’t as boggy and wet. Unfortunately, as much as we’d like to, we can’t control the weather! We can’t predict what the weather will be like throughout the flying season so we always advise passengers to book as early as possible in the flying season in case of any weather cancellations. What is the best weather for flying? We aren’t able to fly when it’s raining as this will damage the balloon envelope and alter the balloon weight which is dangerous. The visibility needs to be good in order for the pilot to have an unrestricted view whilst flying. Winds need to be calm. Not just on the ground but also 1000ft – 2000ft up in the air! Surface winds need to be below 10mph. If the wind is too stable the balloon will take off but won’t go anywhere and if the wind is too strong, it’s not only very risky but your flight would only last minutes! 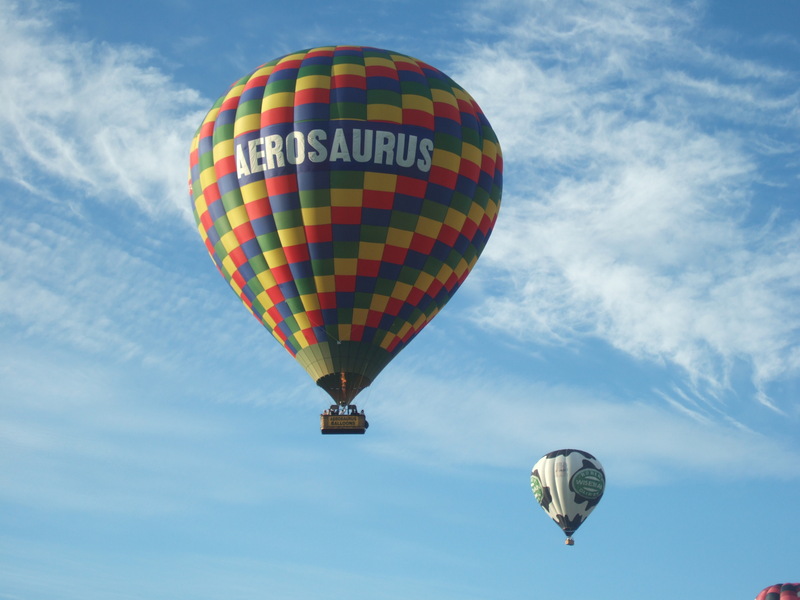 If you would like to take the flight of a lifetime with Aerosaurus Balloons then buy your Champagne balloon flight voucher today! We have plenty of locations across the South West to choose from and prices start from just £99 per person!